How will Trump follow up the strikes on Syria? How will Trump finish what he started by attacking Assad? Left: The USS Porter fires a land attack missile in the Mediterranean Sea on Friday. Right: President Trump delivers a statement on Syria on Thursday. At the start of every war that the United States has entered in the last quarter-century, much has been made—by officials, officers, and pundits—of the number of missiles fired, the brightness of the blasts, and the firm “message” that the president was sending to whatever international outlaw needed punishing. But the real issues, which can’t be assessed at the start and usually wind up with a less burnished glow, are these: how much damage the strikes actually wreaked, how the object of the attack responds, what the president does as a follow-on, and—ultimately—how this whole sequence of events affects the rest of the war and the political struggles underlying it. 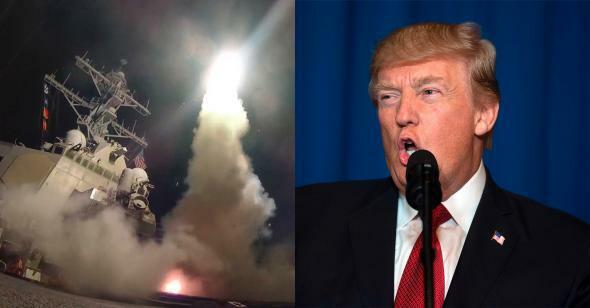 Less than 24 hours after President Donald Trump’s first high-profile decision as commander in chief, all we know is that U.S. Navy ships in the Mediterranean fired 59 Tomahawk cruise missiles at an air base in Syria; that the missiles were aimed at planes, aircraft shelters, petroleum storage bins, ammo supply bunkers, air defense systems, and radars; that, according to the Pentagon’s initial estimate, the attack “severely damaged or destroyed” the targets; but that—according to a press briefing by National Security Adviser H.R. McMaster—Syrian President Bashar al-Assad’s ability to fire chemical weapons in the future has been degraded but not eliminated. Trump and his supporters believe that he sent a signal—not just to Assad but to the Russians, the North Koreans, friends and foes around the world, perhaps especially Chinese President Xi Jinping, with whom he happened to be having dinner as the attack took place—that he is a man of resolve and action who doesn’t hesitate to use force when appropriate. Trump might gain some leverage from this move if he follows up with diplomacy by pushing or plying Russian President Vladimir Putin to put pressure on Assad and possibly re-engaging with talks on a political solution for Syria. This time, U.S. diplomacy would be accompanied by the clear signal (here is a where a signal might have effect) that the United States is willing to back its stance with force. But Trump seems to lack the inclination and the resources to mount a full-scale diplomatic offensive. Secretary of State Rex Tillerson said that the attack reflects no new U.S. strategy on Syria, suggesting that it was a one-off move to punish Assad for using chemical weapons and deter him from doing it again—a measured statement but hardly one designed to plant fear in the heart of Assad or any other American adversary. Then again, Trump himself is a cauldron of mixed messages. Throughout the 2016 campaign, and as recently as last week, Trump has said that, though Assad is “a bad guy,” it made no sense to go after ISIS and Assad at the same time. In fact, he said several times that weakening Assad could strengthen ISIS. Then, on Wednesday, after watching the horrid TV images of children suffocating from a chemical-weapons attack, Trump announced that his attitude had changed completely, that Assad had crossed “many, many lines.” After meeting with his national security advisers, he chose one of the four attack options that the military had laid on the table—one of the lighter options, reportedly—and put it in motion right away. At this point, no one knows—I suspect Trump himself doesn’t know—what his policy toward Syria is: how he sees the wars playing out, how he would like to see them end, what kind of political settlement he’s willing to accept in the interests of peace, stability, or whatever other goal he has in mind. These are the crucial issues—and it will take a lot more than a few dozen cruise missiles to sort out. Clearly, Trump meant to highlight the contrast with Obama, who tended to deliberate at great length—over a stretch of days, weeks, or even months—about the use of force. But there is a fine line between decisiveness and impulsiveness, and we will soon see which line Trump has crossed.